Harvested in Maine, Alaria is a great substitute for wakame as it is so similar to traditional Japanese wakame. Alaria is the most delicate of the brown seaweeds. It can be used to create a Miso soup with a wild, yet delicate flavor. 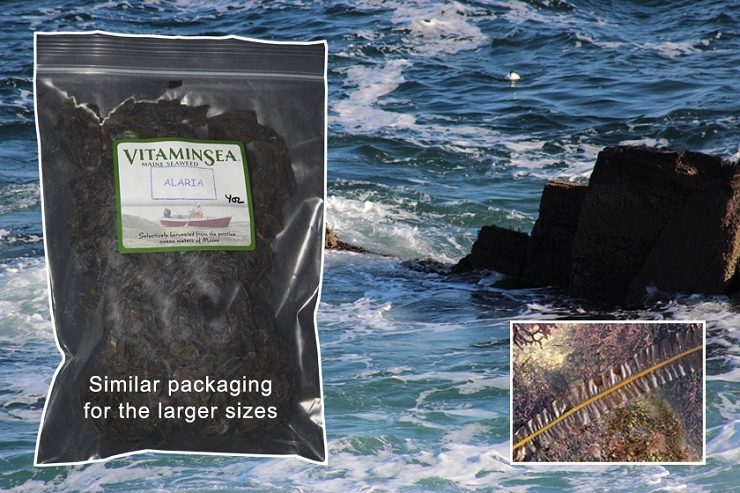 Alaria, as with many sea vegetables, contains many of the vitamins and minerals needed to live a healthy life. Alaria (alaria esculenta) has one of the highest sources of calcium. It is rich in B complex vitamins, vitamins A, C, and K. High in protein , iron, magnesium, iodine, sodium, chromium, zinc, phosphorus, potassium, and dietary fiber. Alaria is almost identical to Japanese wakame biologically and nutritionally. Alraia is excellent for Miso soup and makes calcium rich vegetable soups, and stews. It imparts a chicken-like flavor when cooked with rice. Whole leaf alaria can be used uncooked in salads if pre-soaked, marinated in lemon juice, blanched or steamed. It can also be quick roasted and enjoyed as 'chips'. Alaria has more delicate taste but needs a longer cooking time (40 minutes) than the cultivated Japanese wakame (15 minutes). Soak prior to cooking and use the soaking water. Powdered Alaria is a great addition to any energy or protein drink that needs mineral fortification (particularly calcium).